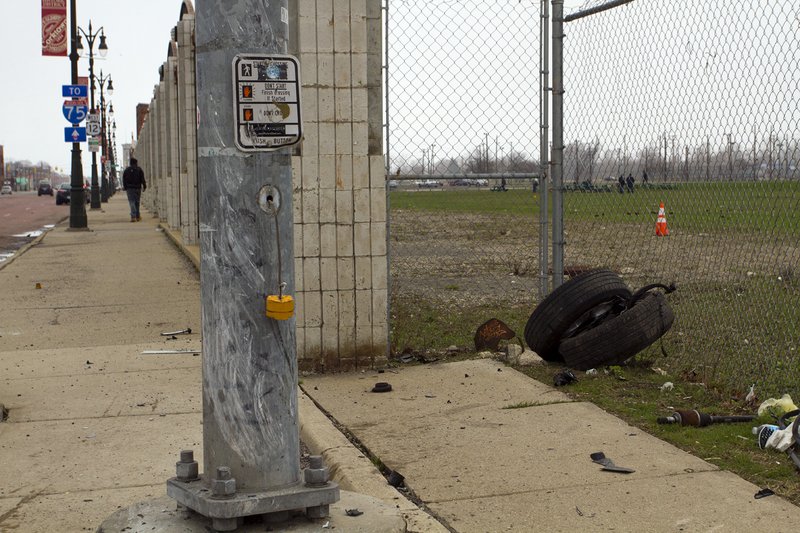 Police found a badly bruised body on the field at the former Tiger Stadium site this morning. Police believe the victim was hit by a car around 1 a.m., but investigators didn’t know about the body until a resident spotted a dead white male at 6 a.m. The remains of the accident scene. The body was found on field, where the orange cone is. Photo by Steve Neavling. Witnesses said the man, in his 30s, sustained serious injuries to the face and head. The fence is about 10-feet high. The body was about 10 to 15 feet inside the fence. A car crashed into a utility pole around 1 a.m. at the corner of the field. Photo by Craig Wilkins. 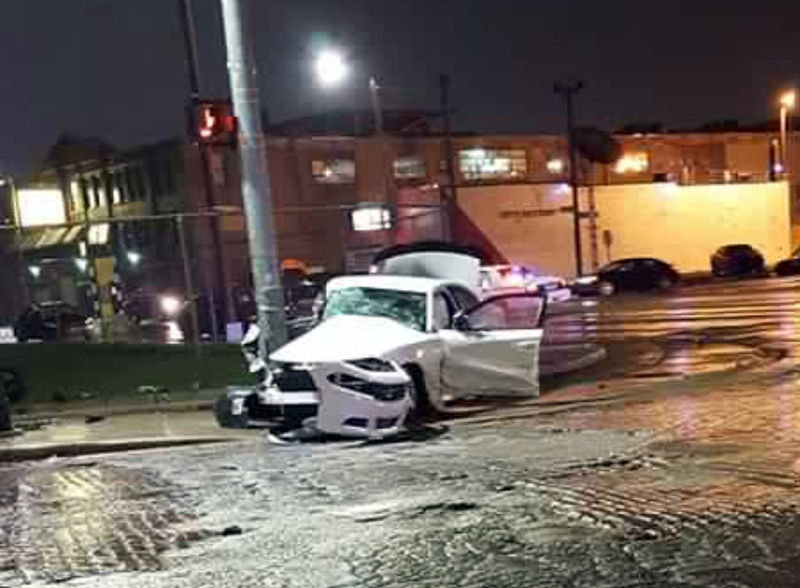 The car accident occurred at about 1 a.m. when a white sedan struck a utility pole at the corner of Michigan and Trumbull. Two tires and parts of the car were still next to the field this afternoon. Next to an orange cone inside the field was a lot of blood. 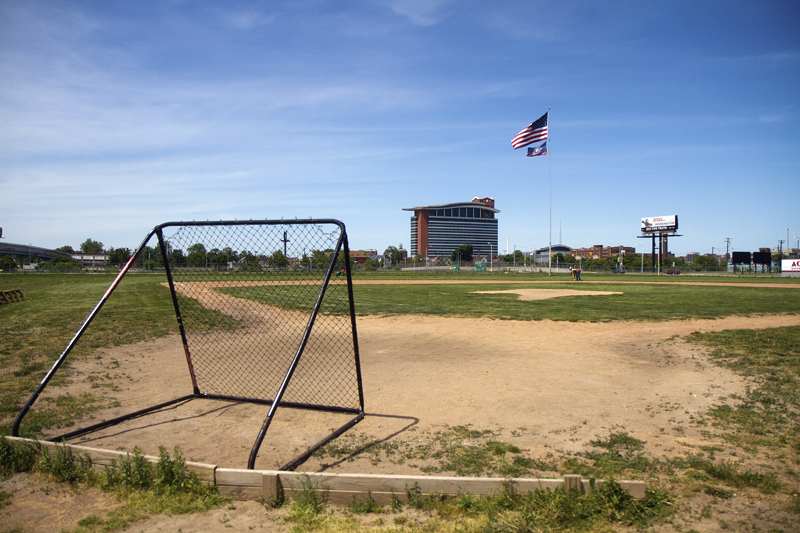 The discovery comes just one day after Motor City Muckraker reported that some police wanted to padlock the field to prevent a rumored protest over plans to carpet the ballpark with artificial turf. Police Chief James Craig quickly dismissed those threats, saying there are no plans to padlock the gates to avoid a protest. Was at this stop light last night presumable minutes after the incident occured. At the time neither police or ambulence had arrived but could see police a few block away and heard sirens when I got home a few block away. For what it’s worth there were actually two cars involved in the accident. In my estimation the black car (not pictured, in turn lane) was struck while turning left from michigan to trumble headed north wheb the white car blew thru the light hitting the black car on its front end driver side. At which point the white car must have riccohetted towards the pole and struck the man who was found over the fence. I just wonder why, if you spoke to the police about the accident why the second car wasn’t mentioned or photographed? It would have been just right of the frame in the picture above. I’ll take “Things I Don’t Believe” for $1,000, Alex. Wow. Was he really just hit accidentally and launched into the field? Hope he never knew what hit him. Sorry anyone lost their Life, but are Police sure the body wasn’t one of the “Leaders” of PAL ? You know the organization that is claiming to be “Preserving” the Site, when they are really DESTROYING a NATIONAL TREASURE, and HISTORICAL SITE !! The man who was hit was from the Western Upper Peninsula, about 9 hours away and I can’t say for certain, but I highly doubt he would be involved with that organization. I have not seen him in probably 10 years, his name is Paul Pesola Jr. and he was only 35 y.o.. lived in the “sticks”, worked on cars for a good part of his life from what I remember. Ashley Larson is right I believe in that Paul would of not been involved in that organization. Paul was originally from Pelkie or better put mail covered by Pelkie post office though his home was not in the town of Pelkie. ~~ From Pelkie area myself.